Our partnerschool in Cadiz, Centro de Lenguas e Intercambio Cultural Cádiz, is located at short walking distance from the beach. The school is situated in one of the better residential areas of the city, in the neighborhood “Bahia Blanca". The school offers modern facilities such as air-conditioning, wifi, and a study room with computers. The school also has a library and a specialized language book shop. Every week the school organizes a fun activity programme for the participants of the summer course. Every day you will have either sport activities or cultural visits together with your fellow students. Each week one half-day excursion and one full-day excursion will be organized to for example a national park, Tarifa and Bolonia. Our school has developed a special program (20 lessons per week, 4 lessons per day) for young people aged 13-17 years who want to learn Spanish and like to take part in various activities and excursions. It is a diverse program that is tailored to the interests of young people. Course materials are included. Every week our partner school organizes a full activity program with daily activities such as sports, excursions, cultural activities, a half day and full day excursion per week. The youth course is available from 15/04/2019 to 26/04/2019 and from 01/07/2019 to 09/08/2019. Prices include accommodation in double/triple rooms, full board, daily activities, one half and one full day excursion per week. With accommodation in a host family: 15/04/2019, 22/04/2019*, 17/06/2019, 24/06/2019, 01/07/2019, 08/07/2019, 15/07/2019, 22/07/2019, 29/07/2019, 05/08/2019*. Whith accommodation in the residence: 01/07/2019, 08/07/2019, 15/07/2019, 22/07/2019, 29/07/2019, 05/08/2019*. Your stay is from Sunday to Sunday in twin rooms with lodging based on full board. Accommodation in the residence is only available from 30/06/2019 onwards. In case you want to start a course in April or June, accommodation will be in a host family. Transfer from Seville airport or train station: € 150,- p.p. (one way). Transfer from Malaga airport: € 195,- p.p. (one way). Please indicate on which airport you plan to arrive. Group shuttle transfer: During the junior courses in summer (16th of June until 11th of Aug.) there is a group shuttle service from Málaga available (only for arrivals on Sundays between 10:30 and 19:00). Price for one way is € 50. Please contact us for more information. 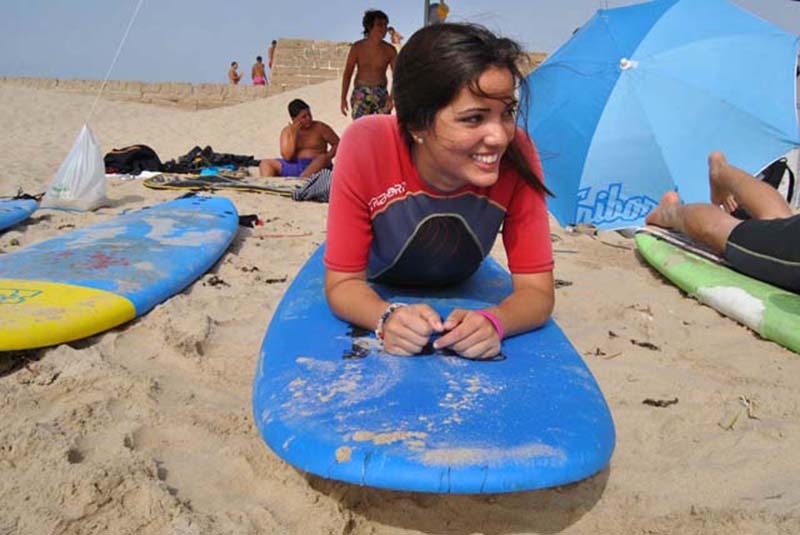 This course combines the standard intensive course with two surf lessons per week. All the necessary surf equipment is included. The course is available for students from 13 till 17 years old. Stay in a host family and get to know the Spanish culture even better! You will get the chance to practice your Spanish after classes when having dinner with the host family. You will stay in a double room based on full board. All host families are located at walking distance from the school. Once a week you can do your own laundry. You room will be cleaned and bed linen will be provided each week. The residence is located near the beach and has fantastic views on the Atlantic Ocean. The historical centre is only at 5 minutes walking distance. You will stay in a double room (full board) with an en-suite bathroom. The school has a lot of modern facilities such as: air-conditioning, Wi-Fi, cafeteria and dining hall, study room, and sport facilities. The residence is a very multicultural type of accommodation, since you will be surrounded by students from all kinds of different nationalities. This way you can practice your Spanish even more!